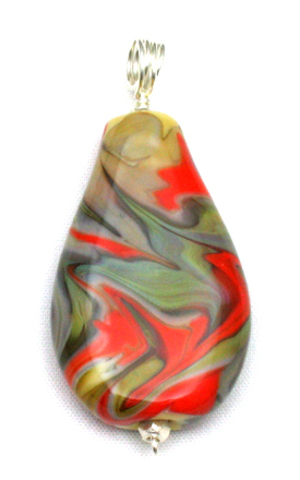 This flat, teardrop shaped pendant bead is one in a series in which I have been working to emulate marble patterns in glass. In this case a base of opal yellow glass was partially covered with two high silver content glasses and a persimmon coral glass. The molten glass was manipulated with a pick and shaping paddle to produce the beautiful patterning. The interaction of the silver with the different glasses produces the outlining and the subtle variations in color.